Canada is in a new era. For 35 years, the country has become vastly wealthier, but most people have not. For the top 1%, and even more forthe top 0.1%, the last 35 years have been a bonanza.Canadians know very well that there's a huge problem. It's expressed in resistance to tax increases, concerns over unaffordable housing, demands for higher minimum wages, and pressure for action on the lack of good full time jobs for new graduates.For politicians, for the country's leading citizens, for think tanks and business and economics commentators, this is awkward. 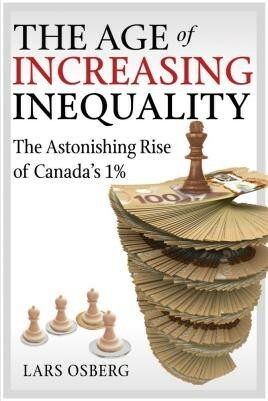 So rising inequality is rarely mentioned in celebrations of economic growth, higher real estate prices, and increases in the value of stocks.Finally, a distinguished Canadian economist is breaking the silence with a compelling and readable account which describes and explains this new age of increasing inequality.Lars Osberg looks separately at the top, middle and bottom of Canadian incomes. He provides new data which will surprise, even shock, many readers. He explains how trade deals have contributed to putting a lid on incomes for workers. The gradual decline of unions in the private sector has also been a factor. On the other end of the scale, he explains the factors that lead to growing high salaries for corporate executives, managers, and some fortunate professionals. Lars Osberg believes that increasing inequality is bad for the country, and its unfairness is toxic to public life. But there is nothing inevitable about this, and he points to innovative measures that would produce a fairer distribution of wealth among all Canadians.